This may have originally stood on Penitentiary Square, which is the GCSU Front Campus area today. Another owner was the McElheny family. 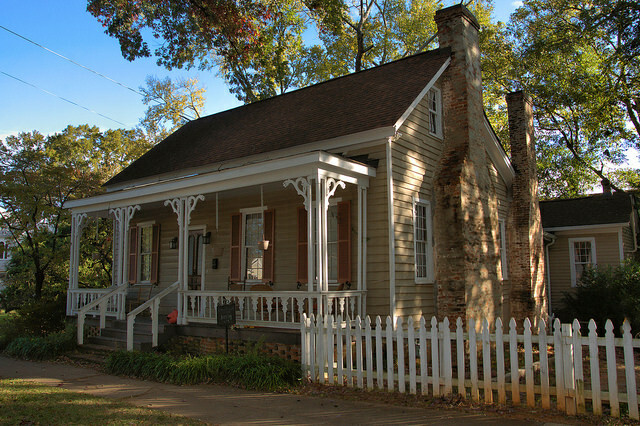 It’s one of my favorite houses in Milledgeville and I hope to learn more about its history. Tony Brown, who grew up next door, writes: This house and the one next door to it were slaves quarters to the large plantation house known as The Cedars. Once the plantation was sold the two houses were moved beside The Cedars house. While I am sure it was not part of the house as originally constructed, the fret-work and scroll-work of the front porch are a delight and an excellent example of fine post Civil War architectural detail design. Wish we did as well today! This house and the one next door to it were slaves quarters to the large plantation house known as The Cedars; Once the plantation was sold the two houses were moved beside The Cedars house. At least that was what was told to me when I grew up in the house “next door”.